This method is for the collection and analysis of metals emissions, including mercury (Hg), from stationary sources. Mercury (Hg) emissions can be measured, alternatively, using EPA Method 101A of Appendix B, 40 CFR Part 61. Method 101A measures only Hg but it can be of special interest to sources which need to measure both Hg and Mn emissions. This method is considered by most as equivalent to the SW-846 0060 / 6010B, 7000, 7471A series of methods. This method also allows for the determination of particulates using EPA Method 5 procedures from the filter and probe rinses if required. The method requires that each mercury fraction generated from the sampling train (there are 5) be analyzed separately and in duplicate using cold vapor atomic absorption (CVAA) following SW-846 Method 7471A. The method allows for the front half and back half of the sampling train to be analyzed separately or combined for non-Hg elements following SW-846 Methods 6010B or 6020. Samples are collected isokinetically using Method 29 train (similar to a Method 5 train) consisting of a quartz filter containing no organic binders and a series of impingers. The 1st and 2nd impingers are filled with 100mL of a HNO3/ H2O2 solution. The 3rd impinger is left empty. The 4th and 5th impingers are filled with 100mL of acidified KMnO4. The 6th impinger is filled with 200-300g of silica gel. It is important that no metal be used in the probe, probe liner, filter support, or in the collection brushes used in sample recovery. Metal parts could serve as a source of contamination of the sample. The method also calls for the solution of KMnO4 to be prepped daily. It is also important to note safety precautions to be used when shipping the KMnO4. There must be a way for the glass container to vent as KMnO4 reacts with acid present in the solution to form a gas and there must be a way for the container to vent, otherwise, it becomes an explosion hazard. After collection, the contents of all impingers are measured to later assist with the determination of stack moisture. The filter is folded such that the particulate is on the inside on the filter and placed in a petri dish. In all the sample collection procedures, it is important to use 100mL of rinsing solution as specified in the method so that the blank correction procedures will be correct. An acetone rinse of the probe, liner, and front half of the filter holder (if particulates are determined) is collected in a separate container. This rinse is not collected if particulates are not needed. The probe, line and front half of the filter holder is rinsed with HNO3 and collected in a separate container. The contents of the HNO3/H202 impingers and associated HNO3 rinses of the impingers can be combined into one container or multiple containers if needed for volume. HNO3 is used to rinse the empty impinger and is collected in a separate container. Another container holds the contents of the KMnO4 impingers which are combined with the KMnO4 rinse of the impingers and collecting glassware and water rinse of the impingers and connecting glassware. The impingers are then washed with exactly 25mL of 8N HCl and put into a separate container holding 200mL of water. The filter, acetone rinse (if collected), and probe rinse are all digested separately with HNO3 and concentrated HF and then combined for analysis. An aliquot of the digestate is taken for the Hg analysis. These samples represent the front half section of the sampling train. The HNO3/H202 impingers and rinses are digested with HNO3 and concentrated HF. Aliquots are taken for the Hg analyses. These samples represent the back half section of the sampling train. The three sample fractions generated from the KMnO4 impingers are all analyzed separately for Hg only. The samples can be analyzed for non-Hg elements using a various techniques including GFAA (graphite furnace atomic absorption), ICP (inductively coupled plasma spectrometry) or ICP-MS. ICP and ICP-MS are the most common techniques used as they achieve the lowest analyte detection limits and are less time consuming for the laboratory. The analytes listed in the table below are those listed in the method, however, it is possible to collect use this method to collect and analyze for other metals. 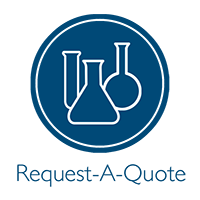 If you would like us to provide a quote for laboratory analysis, just provide us with as much information as you can about your project (the more, the better) and we'll provide you a quote via email. As you are searching or browsing our Analytical Guide, you'll see the Request-A-Quote icon... just click on it to start the request process. Holding Time: None specified in method, however, 28 days from sampling to analysis is the generally established holding time for Hg 6 months for other elements. Preservatives: None specified in method. Analytical Methodology: Analysis for elements by ICP using SW-846 Method 6010B or by ICP-MS using SW-846 6020. Analysis of Hg by CVAA using SW-846 Method 7471A. * The analytes and detection limits listed for each method represent the typical detection limits and analytes reported for that particular method. Keep in mind that analyte lists may vary from laboratory to laboratory. Detection limits may also vary from lab to lab and are dependent upon the sample size, matrix, and any interferences that may be present in the sample.